The roll-out of a new version of the BBC iPlayer on selected Freeview connected TVs and set-top-boxes has been completed, leaving some viewers complaining about problems with the new version, or concerned that their device will not be supported from September. 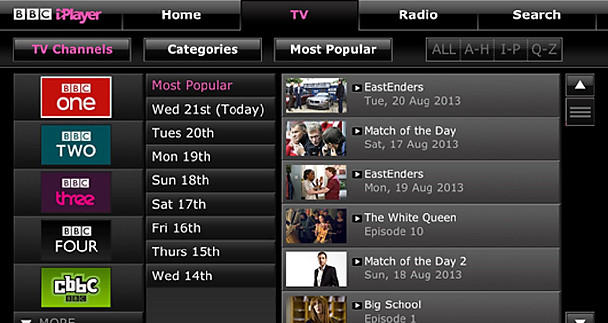 The new version of the catch-up TV service replaces the older Bigscreen iPlayer, which is being retired in September. Viewers using some Samsung Smart TVs have encountered trouble with sound and remote control functions on the new version of the service, meanwhile other viewers are concerned that their device is not on the upgrade list and will lose the iPlayer when the Bigscreen version closes. Responding to comments on his BBC blog, Marcus Parnwell, Executive Product Manager confirmed that they are "working with Samsung" with regards the sound issue and "hope to have an answer soon". While many of the updates have occurred automatically, viewers with the Humax HDR Fox T2 are being advised to upgrade to the latest firmware to access the new version of iPlayer in order to keep using the service beyond September. The latest firmware is 1.03.09. Humax offers support from 9 till 5 via its UK customer helpline on 0344 318 8800. Other viewers see the ending of support for the Bigscreen iPlayer as proof that more standardisation is required across the industry in order to stop devices being obsolete or unsupported. Last week, the DTG announced it was started work on developing the specification for a future 'Freeview Connected' service, which is anticipated to provide standardisation of catch up TV across Freeview devices made by different manufacturers. However, users of existing or older devices are unlikely to benefit from the new standards, as it will involve more than just a software update. The iPlayer help pages contains further information about models compatible with the catch-up service. Viewers can read the relevant BBC internet blogpost, which includes responses from Marcus Parnwell to comments from blog readers. The latest firmware for the Humax HDR Fox T2 is 1.03.12 which has been available for several months. Nothing called 1.03.09 was ever on general release. Of more concern is the Humax HD Fox T2 on which the latest firmware release is 1.02.28 which was released a year or two ago. This uses the big screen iPlayer so will lose access to the BBC iPlayer. It is known that Humax could release 1.03.12 for the HD Fox T2 but they have not done so yet, leaving HD Fox T2 iPlayer out in the cold unless there is a last minute firmware release. I would have recommended taking that up with Marcus Parnwell on the official BBC internet blog. However, I note the blog is now no longer taking comments. Yep, my Samsung TV has updated iPlayer and I can finally watch shows. It always froze before. As mentioned sound is an issue as far and being able to turn it up and down. Also worth noting that Humax have not released the firmware for download, they have only OTA'd it so far..
Humax have now made the firmware available for download - coincidence? Still no news for the HD Fox though..